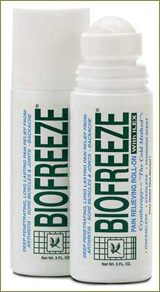 Biofreeze - pain relief "No Mess" roll-on. Available in stock. Only sold through health care providers. Have several in hand for your bedside, the kids sports bags, and one for at work. It's our most popular item. Chiro-Flow Water-based Pillow. Available in stock. AWESOME! Comes with DVD instructions and helpful hints. It is a supportive pillow that has been clinically shown to reduce neck pain and improve quality of sleep! 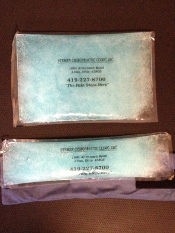 Ice Packs - Sold in 2 sizes - for the neck and low back areas. They don't freeze solid so they mold against you and stay cold for a very long time. We use these type for therapy on our patients! We also sell the sleeve covers which has velcro to hold in place (especially great for the neck so you can walk around with it) These are also a nice size for knees, ankles, shoulders, etc.